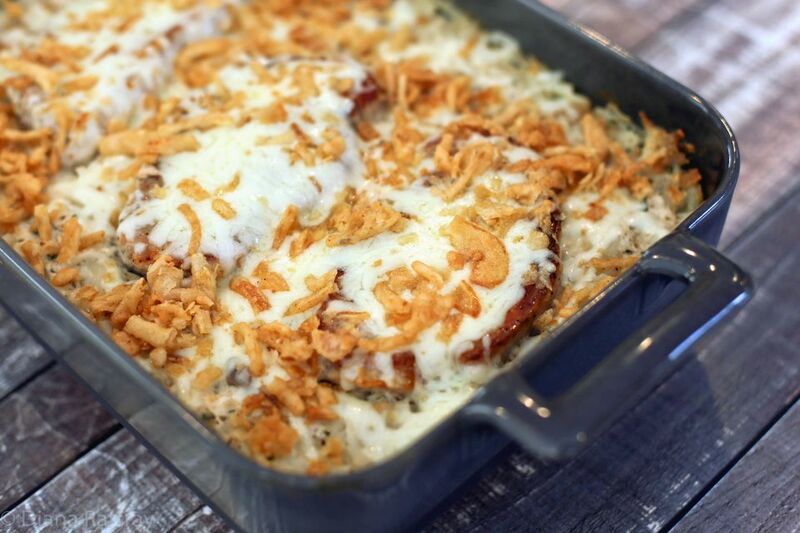 This easy, cheesy pork chop and hash brown bake is topped with crunchy French fried onion rings. This satisfying pork chop and hash brown casserole is budget-friendly, too. Add a tossed salad or steamed green vegetable for a satisfying family supper. Broccoli, peas, or green beans go well with the dish. Lightly grease a 13-by-9-by-2-inch (3-quart) baking dish. Heat the oven to 350 F (180 C/Gas 4). Heat a small amount of oil in a large skillet or saute pan; brown the pork chops on both sides. Sprinkle the chops with the seasoned salt and set aside. In a large bowl combine the condensed soup, milk, sour cream, pepper, parsley, and 1/2 teaspoon of seasoned salt. Stir in thawed potatoes, 1/2 cup of the shredded cheese, and half of the can of the French fried onions. Spoon the potato mixture into the prepared baking dish. Arrange pork chops on the potatoes and then cover the baking dish tightly with foil. Bake for 1 1/2 hours. Top with remaining shredded cheese and French fried onions. Return to the oven and bake for 5 to 10 minutes longer, or until the cheese has melted. Overnight — Spread the frozen hash browns out on a paper towel-lined baking pan. Place it in the refrigerator. Take it out of the refrigerator the next day and pat the potatoes dry with paper towels. Microwave — Spread the frozen hash browns out on a microwave-safe plate or platter. Microwave on 100% power for about 30 seconds per cup of potatoes. Pat dry when thawed.